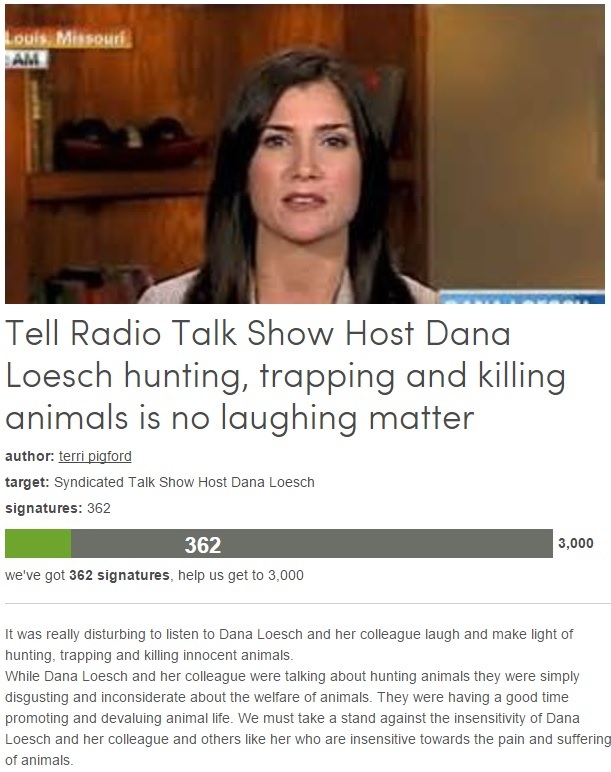 Liberals are petitioning radio and TV host Dana Loesch for reportedly being insensitive to the welfare of hunted animals. It was really disturbing to listen to Dana Loesch and her colleague laugh and make light of hunting, trapping and killing innocent animals. While Dana Loesch and her colleague were talking about hunting animals they were simply disgusting and inconsiderate about the welfare of animals. They were having a good time promoting and devaluing animal life. We must take a stand against the insensitivity of Dana Loesch and her colleague and others like her who are insensitive towards the pain and suffering of animals. Of course, these crackpot leftists all support abortion.